My newest giveaway comes just in time for Mother's Day, although you don't have to be a mother to enter it. Skincare products always remind me of my mom because she takes her skincare regimen so seriously even though, in her view, it's too little too late. She's always taught me to take care of my skin first and worry about makeup second, a tenet I still follow to this day as I moisturize, cleanse, exfoliate, and apply sunscreen diligently. 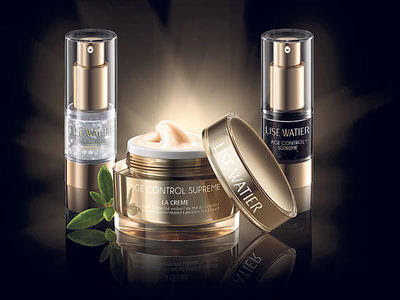 For mothers, gorgeous gals with mature skin, and the skincare lovers out there, Lise Watier has launched their new Age Control Supreme line, just in time for the Canadian cosmetics company's 40th anniversary. The star ingredient behind the Crystal Day Elixir ($45), La Creme ($78), and Black Night Elixir ($45) is Labrador tea, a sub-arctic plant and powerful anti-oxidant whose healing and anti-inflammatory properties have been known to traditional aboriginal medicine for ages. As the Lise Watier publicist explained when I stopped by the launch event, Labrador tea is 20 times more potent than other anti-oxidants on the market like vitamin C, vitamin E, and grape seed extract. Lise Watier spent five years commissioning research and perfecting the special extraction process that preserves Labrador tea at its most potent. (That would explain their wildly successful clinical trials in France.) The rich formulations in the Age Control Supreme line are ideally suited for women 40 and above. Interested in trying Age Control Supreme (or if you're a younger reader, gifting it to a special woman in your life)? I have the entire line (combined value of $168) to give away to one lucky Solo Lisa reader. To enter, simply leave a comment on this post before Saturday May 12th, 12pm PST, telling me what your Mother's Day plans are; include your contact info (email or Twitter) as any entries without a means of contact will be disqualified. A winner will be chosen randomly. Good luck! Hi, great post and thank you for amazing giveaway! Hello! Lovely giveaway and a lovelier blog. For my beautiful Mama, my family and I plan to take her for brunch at the Rockford for her favourite Mascarpone stuffed French Toast. Hopefully, if the weather cooperates, we will stroll around downtown and buy her something special. Regardless of what unfolds, we will spend the day showering her with love. If I'm so lucky to win, please contact me at kooteayuh@hotmail.com Thanks so much and keep the posts coming! My mother's day plans are to take my mama to Van Dusen Gardens - it's one of her favourite spots! And thanks for the giveaway - if I win I'd also definitely give it to my mama! My brothers and sister are taking our mum out for dim sum - its one of her favorite things to do now that she's retired. Thanks for the great giveaway! My mother-in-law organizes a luncheon get together with her sons, daughter-in-laws and their children. We haven't finalized the details, but it will probably be a dim sum lunch at one of the local restaurants in Vancouver. I was interested to read the description of these products. The ingredients sound promising. If I don't win the contest I'll have to check the products out in the stores. On Mother's Day this year I'll be on the 'phone to both my lovely mom and my fun-loving mother-in-law: sadly, I can't actually get together with either of them this year, but cards and gifts are on the way! Thanks for the introduction to these products, Lisa; I've always heard about Lise Watier but never tried any of their items. My mom's skin care regime is simple, but she's diligent about it, and while I've always been lazy about mine, she is inspiring me to be more disciplined! My Mother's Day plans are to take my shopping and dinner. Thank you for the giveaway! My Family is taking me away for the weekend for some fun! To visit my best friend, do some shopping and eat out at some lovely restaurants! What a great giveaway! I would love to try this Age Control Supreme line. My grandmother used to pick labrador tea leaves and would make tea to treat her srthritis! :) Thank you!